Instructive feedback is used to expose learners to secondary targets during skill acquisition programs (Reichow & Wolery, in Journal of Applied Behavior Analysis, 44, 327–340, 2011; Werts, Wolery, Gast, & Holcombe, in Journal of Behavioral Education, 5, 55–75, 1995). Although unrelated feedback may have clinical utility in practice, very little research has evaluated unrelated instructive feedback, particularly for promoting play behavior (Colozzi, Ward, & Crotty, in Education and Training in Developmental Disabilities, 43, 226–248, 2008). The purpose of the study was to determine if play emerged after embedding instructive feedback during the consequence portion of discrete trial training to teach tacts. 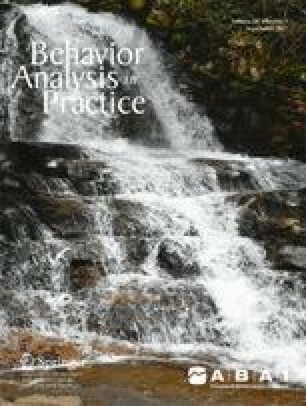 An adapted alternating treatments design was used to compare tact training with and without instructive feedback for play behaviors. Instructive feedback resulted in the emergence of play behaviors during tabletop instruction and a play area of a classroom. We discuss the results in terms of clinical practice and future research. The data were collected while the authors were employees of the University of Nebraska Medical Center’s Munroe-Meyer Institute.